The next generation of outstanding Chem-Dry Protectant™ is here. Not only is Chem-Dry’s PowerGuard Protectant™ loaded with acid-dye resistors to provide excellent stain resistance, but its unique polymer base also makes it an excellent protector for solution-dyed carpets like polyester and olefin. Laboratory tests confirm that PowerGuard mixed with The Natural® out- performs all other protectants. 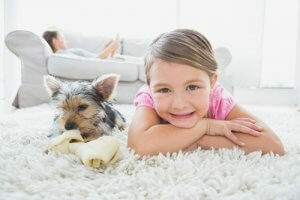 Your carpets deserve the best, so Chem-Dry of Santa Clarita Valley only offers the best. Chem-Dry of Santa Clarita Valley believes in only using the best, most practical products for your home and family. Our carpet cleaning isn’t over when we walk out the door. If you are not satisfied we will return again. We do our best to communicate with you throughout the whole cleaning process so that you can see the difference that our process makes too! Our carpet stain protectant system provides you with quality and care your home and family deserve. Carpet, rugs, and upholstery are meant to be used. Enjoy your living space and leave the cleaning concerns to Chem-Dry of Santa Clarita Valley.